Featuring Summit Extra Pale Ale, Keller Pils, Oktoberfest and a Harbinger of Seasonal Weather Changes. There are two kinds of people in the world: Those who can’t wait for pumpkin-spiced latte season to arrive, and those who are negative about everything. Fortunately, we have something here that should please everyone. For the people who love thick fall sweaters and fragrant slow-cooked meals: The Summit Bonfire Box variety pack, featuring four delicious beers perfectly suited for the fast-approaching mild evenings which you will wisely spend drinking beers in the out of doors. And for the folks out there with bad attitudes: Well, read on! With cool nights, colorful leaves and cozy flannels all mere weeks away, we figure it’s time to sit down by a great big bonfire throwing glowing sparks in the air and share a few 12-oz. 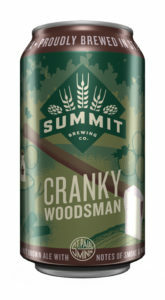 cans each of Summit Extra Pale Ale, Keller Pils, Oktoberfest, and our brand-new Summit Cranky Woodsman — a Nut Brown Ale offering roasty notes of smoke and maple syrup. As delicious as ever, Summit Extra Pale Ale is the first beer our Founder and President Mark Stutrud brewed back in 1986. After 32 years, our flagship is also our most award-winning beer. Most recently, it received the 2017 Great American Beer Fest® Silver Medal for Classic English-Style Pale Ales. With its roots in traditional Märzen-style recipes first brewed hundreds of years ago in Bavaria, our most popular seasonal beer Summit Oktoberfest returns with its rich, toffee malt flavors and a crisp, clean hop finish. Additionally, it’s brewed with a little Grain Country flavor by way of Moravian 37 barley, exclusively grown near Rugby, North Dakota, by the cousins of Mark Stutrud. And last but not least, for all the folks who think July is too soon to be talking about the autumnal equinox, Summit Cranky Woodsman is set to debut on limited draft lines and exclusively inside the Summit Bonfire Box with rich and roasty flavors and aromas suitable for long evenings by the campfire. Brewed with Minnesota-grown puffed wild rice, Cascade hops from Mighty Axe Farms, and Lacey barley from Alexandria, Minnesota — plus a touch of smoked oat malt and just a splash of maple syrup — Cranky Woodsman celebrates the flavorful and aromatic terroir of the Upper Midwest. WHY ON EARTH WOULD ANYONE WANT TO WAIT TWO MORE MONTHS FOR THIS? Serving Tips: Serve at 40ºF in a nonic pint glass alongside walleye fritters, a juicy lucy with thick-cut fries, or a big steaming-hot bowl of chicken wild rice soup.